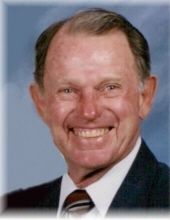 Lewis Joslyn, age 85, of Clarinda, Iowa entered into peace Wednesday, February 6, 2019 at the Eiler Place, Clarinda, Iowa. Funeral Celebration of Life Services will be held 11:00 AM Saturday, February 9, 2019 at Ritchie Funeral Home in Clarinda, Iowa with Scott Davison officiating. Visitation will be held Saturday at Ritchie Funeral Home from 9:00 a.m. to 11:00 a.m. with the family greeting friends prior to the service. Inurnment will be held at the Clarinda Cemetery in Clarinda, Iowa 2:00 p.m. Sunday, February 10. Memorials may be directed to Clarinda Foundation. Memories and condolences may be shared with the family on our website at, www.ritchiefuneralhome.com under Obituaries. Arrangements were entrusted to the Ritchie Funeral Home of Clarinda, Iowa, where we ‘Celebrate Life’. "Email Address" would like to share the life celebration of Lewis Earl Joslyn. Click on the "link" to go to share a favorite memory or leave a condolence message for the family.